The NYC squash community is always welcoming to beginners, and it’s easy to learn the game. Here’s what you need to get started. Your first step is to find a club – your club membership opens up lessons, courts, opponents, and league play. 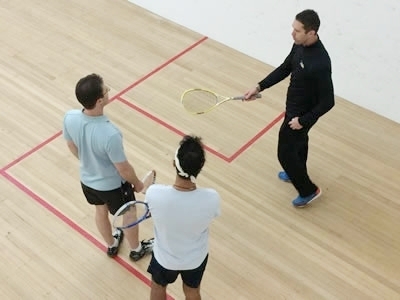 The local squash community can play at over 30 clubs in the greater NYC metropolitan area. Squash is an easy sport to learn, but professional instruction at the beginning is always recommended. Players in the greater NYC area benefit from many of the most respected teaching pros in the world. Your first stop for a racquet, shoes, and protective eyewear is always your club’s pro shop, but here are some local equipment retailers and online resources for improving your game.